The 'little' of this next design involves criticism of my own work ("About time", you say) and concerns the matter of design thoroughness. In my book, this is something I position as being part of the pursuit of elegance in your design execution. 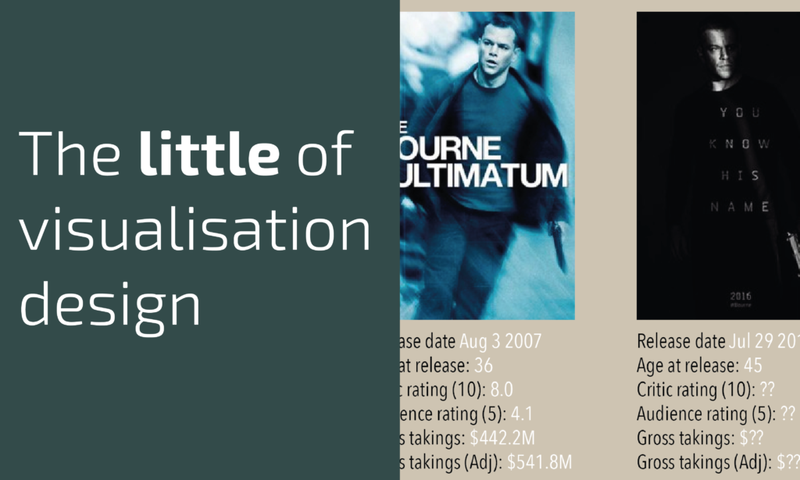 The graphic in question is one I quickly compiled and tweeted out yesterday morning, looking at analysis of Matt Damon's roles in the the Jason Bourne movies, to mark the release of the latest movie in this series. 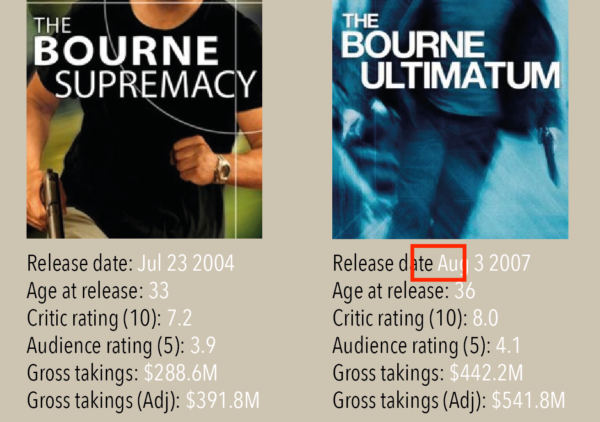 The issue I want to highlight here is the simple failure to be consistent in my use of a colon following the 'Release date' label in the captions below each movie poster. I missed two colons. A small matter you might think and you would be right but ever since publishing the graphic I've been agonising over this mistake. Remember, this is the 'little of visualisation design' and these type of errors (left in through a failure to thoroughly check work) demonstrate a failure to either find time or care enough to pay attention to the smallest of details. These are building blocks of quality visualisation design so care over every last detail. You could also have right aligned the data for easier reading. Well, after publishing the graphic, I continued to play and tried aligning those captions labels/values around an aligned colon (it is how I noticed the missing ones! ), so the values would all have been left aligned, the labels all right aligned. However, it seemed to break the overall composition/flow of the layout a bit. One thing I definitely would change would be to swap the colours, making the values black, the labels white. Curious as to the choice of 1960 as x_min on your bubble plot and inclusion of the 1960s and 1970s in the top stacked bar plot as well – for an actor born in 1970 and whose first appearance as an actor was in 1988. A wider horizontal distribution might allow for better discrimination between individual points? Yes, in isolation you’re absolutely right. 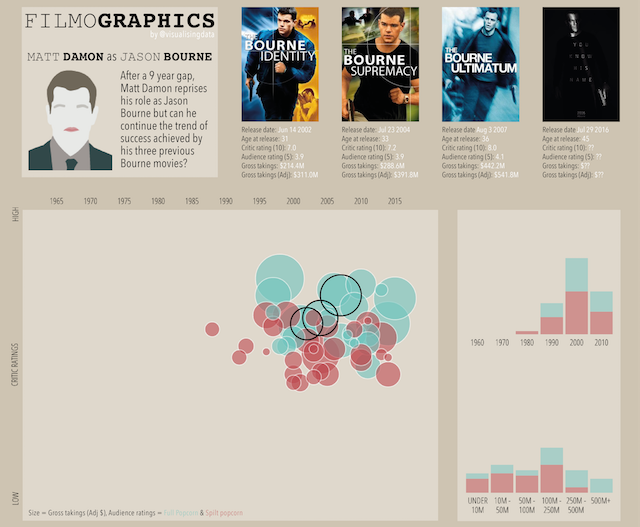 However, the charts shown are static, uneditable screengrabs taken from a larger interactive project called Filmographics (http://filmographics.visualisingdata.com/) which reveals the movie career fortunes of 60 actors/directors. The axis had to be fixed from 1960s to accommodate the variability of data in this larger project. Got it – thanks! Love the blog btw. Los relojes Rolex son símbolos de excelencia, rendimiento, prestigio y también innovación.